I mentioned in the post In Memorium that Lesley Zulberg’s magnificent collection should have been exhibited rather than languish as it did, lost amidst the pith of the Big Naartjie. 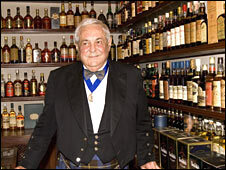 Whilst he was amassing his specimens locally, on the other side of the Atlantic a Brazilian by the name of Claive (Clive but with amended spelling so that Brazilians don’t pronounce it “Cleeve”) Vidiz was putting together what would become the world’s largest whisky collection. Housed for many years in a private museum – in fact a remodelled wing of the man’s home in Sao Paulo – it was bought lock stock and cask by Diageo in 2008 for an undisclosed sum. Liquor giant Diageo is not typically known for its benevolence, however in what has been a grand gesture to both the industry and to whisky lovers, it has (for the foreseeable future) bequeathed the collection, now called “The Diageo Claive Vidiz Scotch Whisky Collection, to the Scotch Whisky Experience, an exposition located on the Royal Mile in Edinburgh. The collection is thus being exhibited and is accessible to the general public in the heart of the Scottish HQ, a more appropriate scenario one could not hope to imagine. James Buchanan’s: The Diageo Archive Team has dated this bottle back to 1897. It is the oldest bottle in the Collection. Strathmill: To celebrate the distillery’s 100th anniversary, Strathmill produced only 100 bottles of this particular expression. 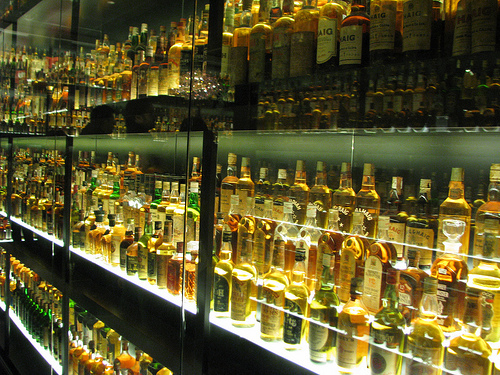 These bottles were gifted to sitting Presidents, the Queen and Claive Vidiz. Claive’s bottle was number 69. Jubilee Collection: This is the full collection bottled by Gordon & MacPhail in 1977 to commemorate the Queen’s Silver Jubilee (25yrs). It is very rare to have the complete collection. Dewar’s Centennial Flagon: In 1986 Dewar’s produced their “Centennial Flagon”, a replica ceramic decanter to celebrate the historic brand of whisky. Each person gifted a flagon was asked to record their thoughts about Scotch Whisky. These records were then stored to a time capsule which was buried in the Dewar’s gardens in Perth. I was a somewhat concerned that collection would become static, and potentially overhauled at some point in the future, but my fears were unfounded. There is a firm plan in place to grow the collection consistently over time. The SWE’s stakeholders, which include all the major Scotch whisky distillers, will on an annual basis set aside samples of their new bottlings to be added to the collection. Imagine being included on those mailing lists! One can only dream. Anyhow if you find yourselves in Edinburgh, be sure to bear witness to Brazil’s greatest contribution to Scotch whisky. In the meantime, have a great weekend and may the dram be with you. This entry was posted in Uncategorized and tagged Claive Vidiz, Scotch Whisky Experience, Whiskey, Whisky, Whisky Collection. Bookmark the permalink.